From the Hancock County Courthouse, go north on Hwy 15/16 for 0.6 mile. Bear left on Hwy 16 West. Go 8.8 miles to Green Spring Road (dirt). Turn right and take Green Spring Rd. for 0.6 mile. The cemetery is on your left. 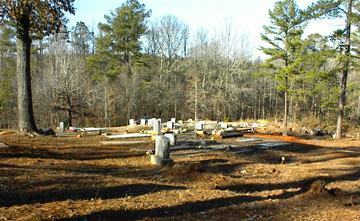 Graves numbered 400 and higher are new since the original survey and are located somewhere in the cemetery. Age 86 All info per funeral home tag. The name is on a loose iron plate on top of slab. "Houston" across top of grave. Only one date on this adult-sized slab. Graves 49 to 61 are unmarked. "He was attendable to his father and mother"
Graves 67 to 75 are unmarked. Graves 77 to 83 are unmarked. Cross on headstone. Headstone is sinking. Information painted on concrete block on top of grave. Numbers 108 to 136 are unmarked graves. "The Lord is my refuge." Has unreadable Ingram Bros. funeral home marker. "Father" "Lonnie; Moses; Joseph, Sr; Julius; Frank, Sr.; E. Leon, Sr.; Richard, Jr."
45. Only one date. 45 not shown as years but is probably age in years. Graves 159 to 197 are unmarked. "In memory of our mother" Gravestone spelled as "Lawrace" but correct spelling is probably "Lawrence". Graves 204 to 206 and 208 to 219 are unmarked. All info per funeral home tag. Graves 227 to 233 are unmarked. Graves 235 to 245 are unmarked. Graves 262 to 268 are unmarked. Graves 281 to 290 are unmarked. All info per Watts Funeral Home marker. Last name spelled "Lawrece" but probably "Lawrence". All info from funeral home tag. Last name spelled Baeley on gravestone but probably is Bailey. "Always in our hearts. Beloved husband, father and grandfather." "Mother, sister & friend. I have kept the faith." 4 graves each marked by a rock at the head of the grave. 5 graves marked by rocks. Marked by a rock at the head of the grave. Very hard to read this stone. Marked by a flag stone or sunken. A small wire fence could surround 2 graves. Mound of dirt could possibly be a grave. Info per funeral home marker. "Bill". We will always love you. "Lightfoot". Loving husband and father. Age 86. Information per obituary. Georgia PFC 789 Med Sanitary Co.